Lectures are held on Mondays 12-1pm in the Cruciform Lecture Theatre 2 and on Wednesdays 9-10am in the Lankester Lecture Theatre, Medawar Building. Assessment:� 85% final exam, 15% coursework essay. 4 Jan 23 (Mon) Molecular genetics of the BX-C (WR) [regulatory mutants]. 1. "Principles of Development" (2nd edition 2002) by Lewis Wolpert and others (Current Biology Ltd, Oxford University Press) approx �30. Copies available in the DMS Watson library. This is a well-illustrated book written at an appropriate level – recommended. 2. 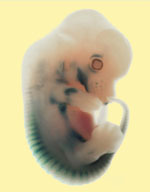 "Developmental Biology" (7th edition 2003) by Scott Gilbert (Sinauer Associates, Inc., Sunderland Massachuetts). This is an excellent book that covers more ground in more detail than Wolpert's book, and costs a little more (approx �40 from Waterstones). Copies are available in the DMS Watson library. It comes with a CD and also has an associated web site. If you decide to stick with Developmental Biology in the third year, this will see you through. If not, you can always sell it on to next year's 2nd year group. 3. "Molecular Biology of the Cell " (4th edition 2002) by Alberts et al. (Garland Publishing Inc. NY and London). Most of you will have this book already (if not, you should have); it is used in several other courses in all three years. Chapter 15 "Cell communication", Chapter 17 "The cell cycle and programmed cell death", Chapter 20 "Germ cells and fertilization" and Chapter 21 "Development of multicellular organisms" are of particular relevance to this course. Start by reading the relevant sections of Alberts et al (MBC), Wolpert (Principles of Development) and/or Gilbert (Developmental Biology) (see above). Then read one or more of the REVIEW ARTICLES recommended by the lecturer. Only if you feel compelled by curiosity and have time is it necessary to delve through the original research articles. In general, if in the examination you cover all the main points discussed in the lecture and demonstrate understanding as well as recall, this will be sufficient for a 2:1 mark. To gain a first class mark (>70%) you will also need to demonstrate that you have read outside of the lecture notes - this means including facts/discussion in your exam answer that could only have come from extra reading. REMEMBER - diagrams are invaluable; use them whenever they would be helpful. Apart from anything else, it is very tiring for the examiners to have to read close-packed lines of scribbles, when a simple diagram with a brief description would do the job. The examiners are not necessarily looking for examples of perfect prose in your essay answers. This is not a course in English Literature. However, a WELL-ORGANIZED essay is a good essay. Start off by making a few notes at the top of the page to help you remember the main points you want to cover and arrange them in a logical order. Time spent at this planning stage is well-spent. Keep calm, with an eye on the clock. It is often better to leave an answer unfinished and move on to the next one if you are running out of time - return to it at the end if you can. It is better to have four partially completed answers than only three comprehensive answers. Of course, it is even better to have four comprehensive answers!